How many of the following statements do you agree with? As soon as you come to a question you doubt strongly or disagree with, you are finished and free to move along. Based on my experience in the music business, I’d say you have less than a .01% chance of getting to the bottom of the list. If you happen to be one of the chosen ones that makes it all the way, congratulations! You may have just discovered one of life’s keys to happiness. Musical Survey- Do you agree with the following? 2. Human beings are wired to play music. 3. Participation in musical activities is healthy and fun. 4. I imagine that playing an instrument might be fun for me too. 6. Music challenges the brain and keeps you growing mentally. 7. I prefer folk and acoustic music over commercial pop. 8. 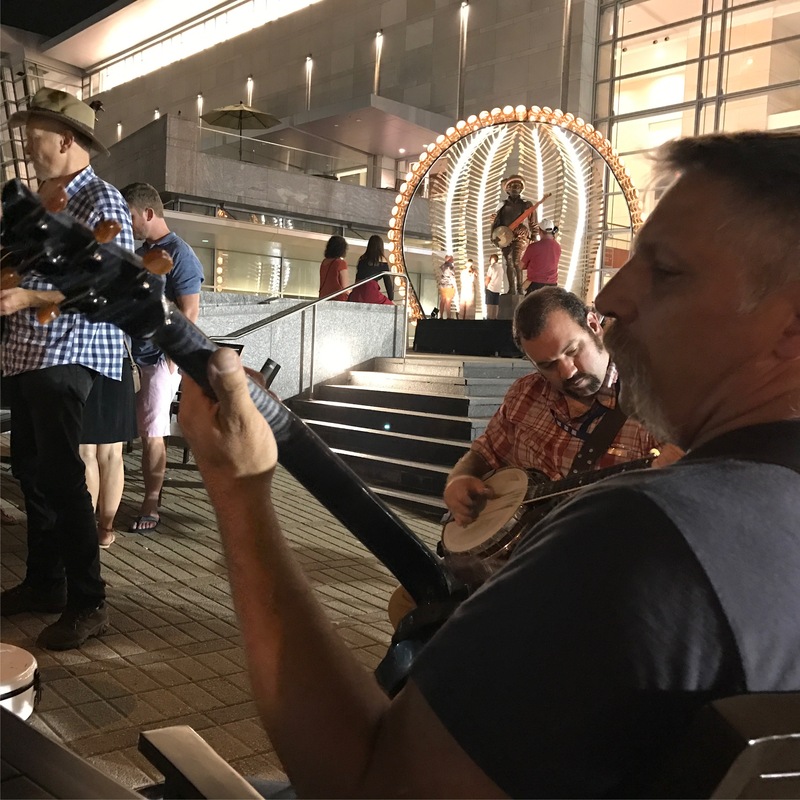 Acoustic instruments can be played anywhere, any time. 9. Groups composed of guitars, mandolins, fiddles and banjos can make nice sounds. 10. I know of at least one other musician in my area that I might interact with musically. 11. It is easier to learn a second instrument after knowing one. 12. The banjo is a great in good hands, dangerous in others. 13. For the most part, banjo and guitar are related. 14. The banjo has 4, 5, or 6 strings. 15. Good banjos are easier to play than cheap ones. 16. Banjo players sometimes spend too much time tuning and adjusting. 17. Having consistent even tension on a banjo is important for best sound. 18. Getting the best banjo for the money aids in learning progress. 19. 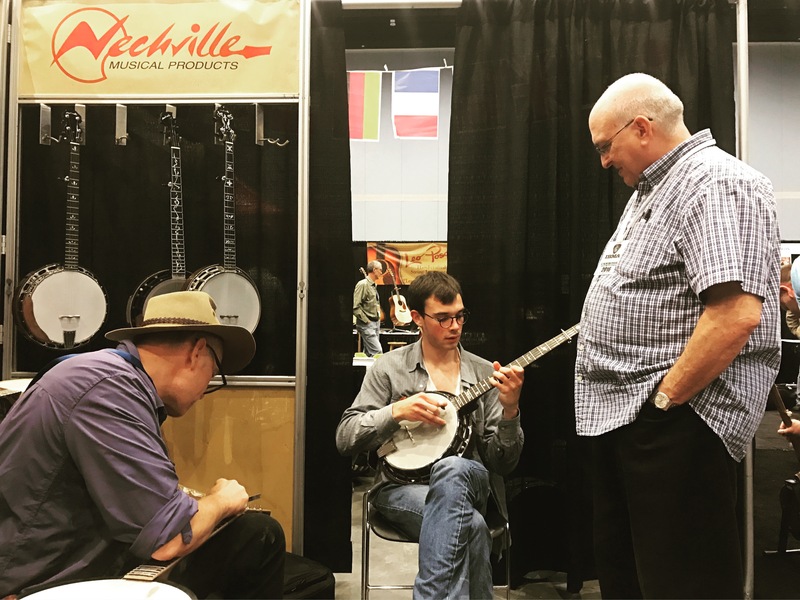 Nechville has updated the banjo’s playability, comfort and reliability. 20. There is such a thing as a versatile banjo tone. 21. 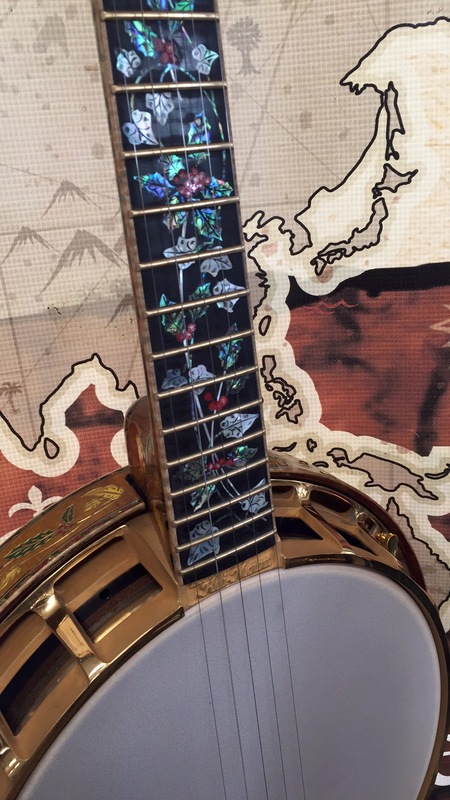 Nechville banjos are the most versatile as to range of tonalities. 22. No other banjo is as easy and foolproof to adjust and service. 23. If a Nechville sounded right and was priced right, I’d want one. 24. I should learn more about Nechville 4-5 and 6 string banjo offerings. 25. Tom, Al and Brett are waiting to help me find the right instrument. 26. 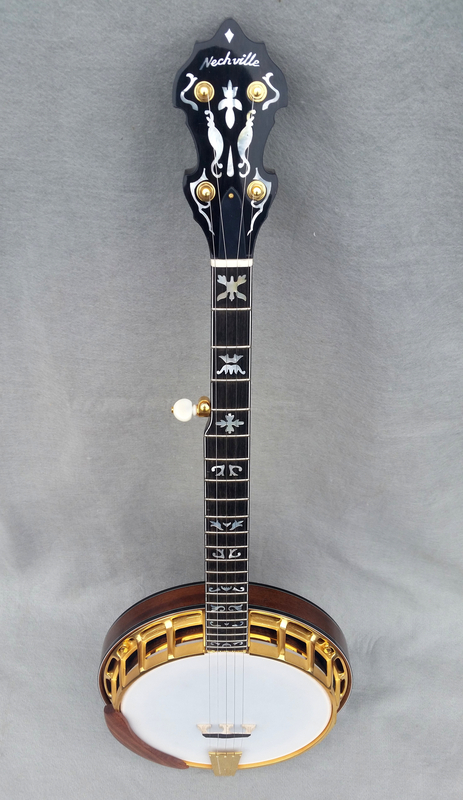 Getting exactly what I want in a banjo means a worthy investment over a lifetime. If you made it this far, Congratulations! You are one in a million. Please click here to receive your no obligation quote, or simply pick up the phone and call. We love it when a new Nechville picker is born! 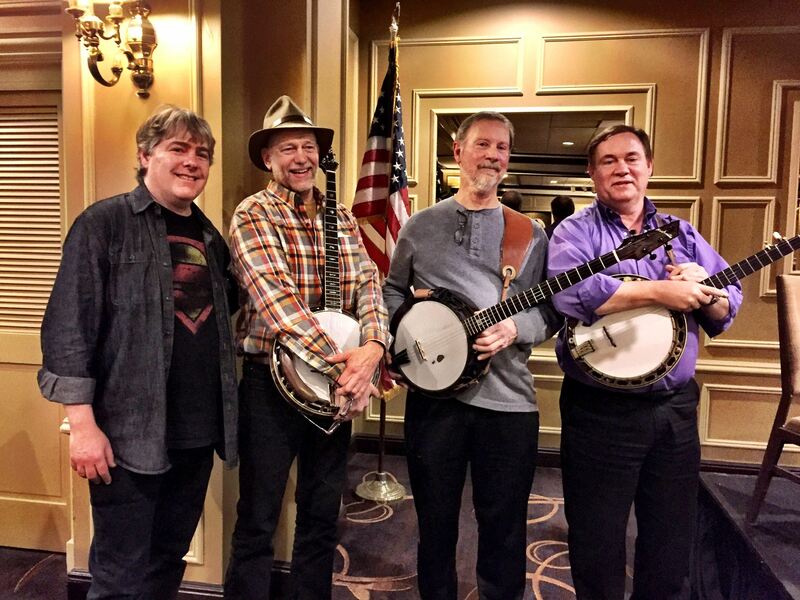 At Nechville Musical Products, we are happy to see the banjo reaching far beyond its original bluegrass roots. 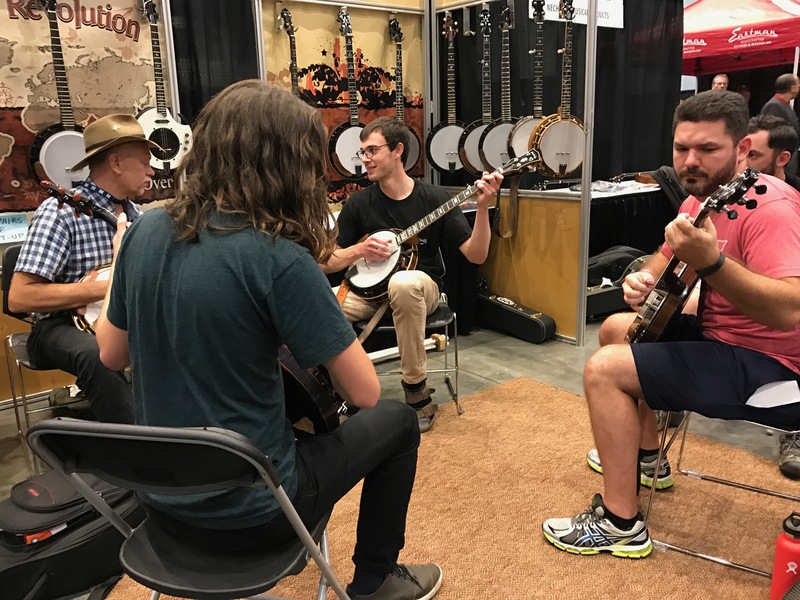 With added stage volume and new (sometimes electric) instruments being introduced into the mix, the challenge of providing banjo amplification solutions is also growing. We are currently and continually experimenting with solutions that meet today’s current challenges. 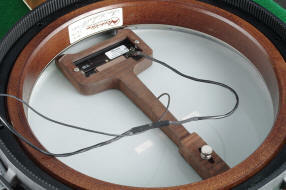 Our goal when electrifying banjos is simple- plug and play. We want no issues with feedback or strange sound, no matter how big the stage is or how many drums and guitars you have to compete with. We also want the acoustic sound to be easily retained or brought back for acoustic and studio sessions. The signal from a banjo outfitted with a pickup is typically sent to a house PA system through a direct input (DI) box. The DI provides a low impedance signal via XLR cable so that the signal isn’t lost or degraded on the way to the engineer’s board. This can also be accomplished by plugging into an amplifier with the ability to send the sound to the house PA. This allows direct control over the tone and volume of the your amp, which acts as a monitor. However, it may complicate the feedback issue, depending on the features of your particular amp. Amplifying acoustic banjos introduces a new set of challenges. There are many factors to consider. 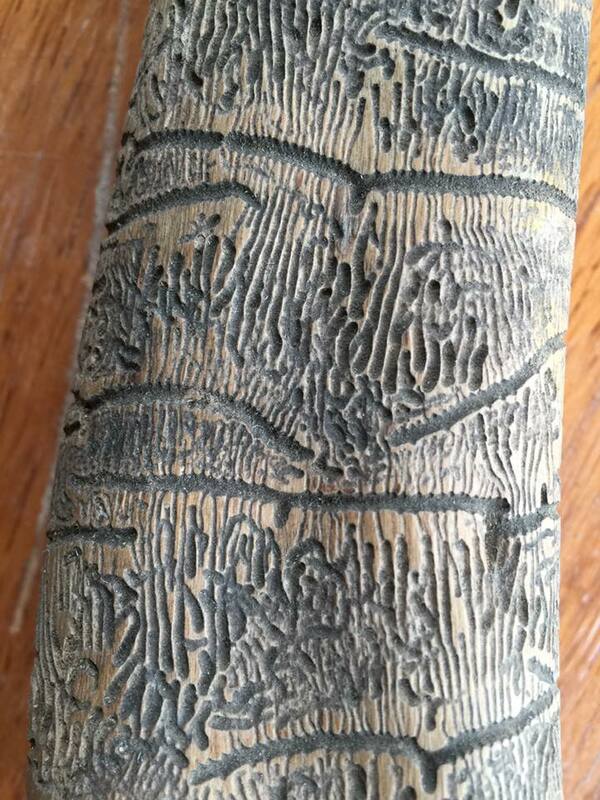 Will you need an expert repairman or luthier to install it? For most players, they would prefer to limit the time and expense and do the installation themselves. Current solutions battle ease of installation with loss of acoustic sound. If your acoustic tone is lost or altered it is not a great solution. 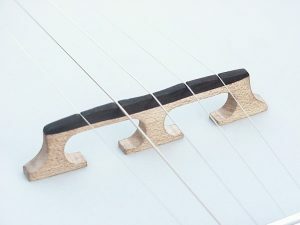 Mounting a magnetic pickup to the coordinator rods, or in the case of a Nechville banjo to a removable brace, is less intrusive to the acoustic tone. This does, however, often produces an amplified tone with too much of an electric guitar flavor. A piezo pickup produces a signal with an amazing ability to create a natural, airy tone. It does a great job of capturing the essence of the banjo sound. A piezoelectric pickup carries a very high impedance signal and is most effective when properly buffered by a circuit placed as close to the signal as possible. 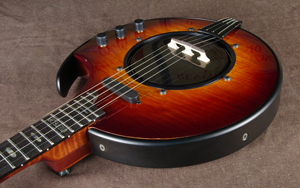 A piezo operates differently pressed up against the head of a banjo as opposed to under the bridge on an acoustic guitar. It can fail to capture the rich low-mids associated with the fullness of a banjo, and end of sounding thin or “tinny”. 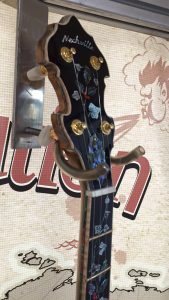 The Meteor Electric banjo was designed in the 1990s with the aid of Bela Fleck, Alison Brown, Eddie Adcock and others. It is truly a plug and play instrument. It allows the user to blend the best of the magnetic and piezo sound. The smaller head on the Meteor allows for an authentic banjo tone but limits the surface area of the vibrating membrane to reduce the chance of feedback. 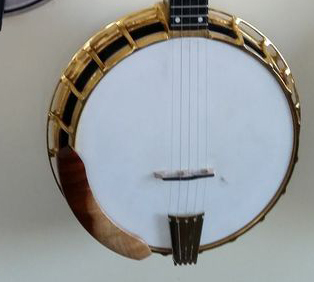 Recent research and development at Nechville has currently led to an acoustic banjo pickup that utilizes the same dual pickup technology designed for the Meteor electric banjos. The combination of the warmth and balanced magnetic signal with the articulate and bright piezo signal is the solution that Nechville has built into their state-of-the-art dual pickup called the Acoustic Harness. Special electronics have been pioneered that allow the vastly different signals from the piezo and magnetic pickups to be blended on board the instrument. Once an ideal balance is achieved at the source, there is no need to continually adjust it. You can be confident you are getting the source sound you’ve dialed in every time. Fine tuning, volume and EQ adjustments can be made by the sound engineer or through your own preamp or personal amp. Installation of the Acoustic Harness is easy. There are at least two ways to mount it in a Nechville banjo. After optionally adhering one or two thin metal inductors to the head, the Harness drops into place and is held securely by the wedge fitting action of telescopic legs that rest in the gap between the tone ring and head. The pickup adjusts up and down and is fixable anywhere along the mounting legs. A jack body and bracket is provided that securely mounts to the outside of the Heli-Mount frame which can stay there even if the pickup is removed. Contact Nechville to stay up to date on our latest offerings. We also provide custom installations ranging from MIDI/synth pickups to simple piezo or magnetic installations for many stringed instruments. What Is a Banjo Bar? The other day, when my old friend CC from Nashville asked why I couldn’t hang around, I said “Banjo Bar.” He said “What’s a Banjo Bar?” and I knew I should’ve kept my mouth shut. A Banjo Bar at Fred’s puts a serious smile on your face and gets your feet tapping, but it’s a challenge to describe properly, plus CC wasn’t invited, so lacking an elevator pitch, I just said “I’ll tell you when you’re a little older, Son” grabbed my hat and skedaddled before he grabbed me. But on the long drive over to Fred’s, I tried to figure out how to describe it to CC or anybody else, especially if they’re not invited. It starts with the place. As you get there late afternoon, you go around the corner from a castle; follow the guys with gig bags over their shoulders down a winding narrow street, kind of shadowy, to a house with light green shutters and a light green door, almost hidden under vines reaching up to the second story. If you get close and squint, you can see the name under the bell: “Fred Simon.” Once inside the main room, the view immediately dazzles as you look out onto the deck, like the bow of a ship headed south over a sea of sunflowers, the far shore being the watershed line of this particular continent, where the propellers of a wind farm spin slowly in the distance. At that point, most of the action will be taking place between the countertop island in the main room – loaded with bottles and glasses and nibbles– and the deck – garnished with gig bags – where a couple of banjos, guitars and a fiddle will be going. Someone will be singing oldies like “You Are my Sunshine” or “Downtown” while others lean on the railing, or relax on chairs, enjoying the good sound. But the concert hasn’t started yet. Far from it! Here at Fred’s, folks customarily greet each other with a song and some picking. This is just the appetizer. Fred’s place has a down-to-earth aspect where first things come first: namely the food. Fred worked in his family’s restaurant in his younger days, and this man knows how to feed his friends – heartily and efficiently – and then kick off the concert on time. But you’ll eat what everybody else does, pretty much extended family style, maybe sitting down at one of the tables, standing by the fireboard, leaning on the countertop or perched on the landing of the hardwood staircase – lined with a dozen stringed instruments – leading up to the studio. Once folks are fed, no dawdling, Fred coaxes everyone downstairs to the concert level, which merits a description. At the bottom of the stairs the floor space is the same as the main room. On the left (street side), no windows, because the house leans up against a hill, so a couple of stone arches keep the hillside out of the house, and form a backdrop for the stage area. On the right, you’ll find another deck with a pool built into it. You’ve got basically the same view to the south, but by this time, it’ll be dusk and the lights of the wind farm will be blinking on the horizon. Below the deck, a garage opens to another street. So if you get the picture, this house on a hill, between an upper and a lower street, has three levels: concert/pool level, jam session/food & drink level, studio/bedroom level. Meanwhile back at concert level: around 9 pm, forty or fifty people settle onto chairs, benches, couches and cushions to take in the concert. Of course that dang post in the middle of the room is a little tricky to see around, but as it holds up the rest of the house, folks tolerate it. Anyway this is the Banjo Bar, in a friend’s house, not some fancy-dancy, thousand-seat auditorium. And here, folks share music, and sometimes so many are playing at once that the musicians overlap into the audience area. In this homey, welcoming, relaxed and generous atmosphere everybody chips in to cover the cost of food and drink and to remunerate the performers – all top-notch and literally within arm’s reach of the listeners. And though all good things must end, the close of the concert simply means the start of the jam session, usually with a migration up to the kitchen level for some refreshment. Now anything can happen, for example in November last year Russ Barenberg was there for the concert, along with his wife Susan Kevra, vocals, and their friend Rachel Bell, accordion. After the concert, up at the kitchen level again, I was sitting in the middle of the main room on a straight back chair facing the deck where Nasser and some others got started on percussion with a North African feel to it – relaxed, but energetic – and feet started to tap. Flap got the stand-up bass thumping just behind my left ear; Rachel was seated to the right of me and felt inspired to fire up the accordion; Susan brought out a clarinet from somewhere and bluesed a B-flat from it that floated over my head and latched onto my ear whiskers; Patrick started clacking the spoons just in front of me and my feet were a-jiggle. Then Fred went to picking his banjo just to my left. 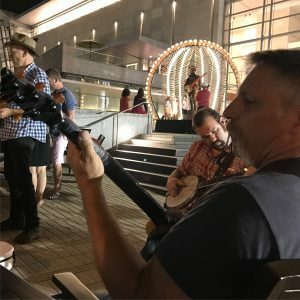 My feet felt like tapping, but there was no point, as my chair was keeping the beat all on its own, and I just hung on and found myself surrounded by a jam session. It must’ve been Remy’s fiddle that tipped the balance, because that music just lifted me and the chair about three inches off the floor. Fred noticed me hovering, and picked up the tempo. Everyone followed, raising the chair another foot, and they all kept me bouncing and airborne for about twelve minutes, before they let me land. Then Susan got a contra dance going and started calling out the figures for a sure enough shindig. That evening’s Banjo Bar, like many others, continued until the predawn brought a hint of color back to the surrounding fields. Neighbors wandered home, while visitors from afar bedded down right there at Fred’s. And of course, some Banjo Bars are followed by master classes with, for example Russ did one the next day. So I guess I can tell CC all that about the Banjo Bar, plus Nasser Soltani’s comment that for him it’s playing at a professional level, but with the feeling of being at home, close to an audience made up of friends. Now old CC just has to meet Fred and get an invite. THE CONCERTS – Fred has organized 35 Banjo Bars since 2010. In every concert, Fred is sure to play, either in the first thirty-minute session, along with friends from his groups Camel Ride and Joey’s Band or other opening acts. Or, thanks to his versatility, he may play with the headliner in the second session, usually lasting about ninety minutes. Themes range from bluegrass to modern jazz, from time-tested oldies to original compositions, in an international context, with musicians such as Russ Barenberg from the US, Lluis Gomez from Spain, Papa Banjo Redon from France, Ben Somers and the Absentees from the UK, and Nasser Soltani from Marseille. Fred’s often joined by his good friends Bernard Minari on mandolin, and the Portalès brothers: Daniel on mandolin and Patrick on guitar. TOM NECHVILLE & FRED SIMON – Fred had tried out one of Tom’s acoustic banjos thanks to Papa Banjo Redon, and liked the fret board. Fred then contacted Tom via the web, and ended up ordering a Nechville Cosmos Electric Midi banjo. 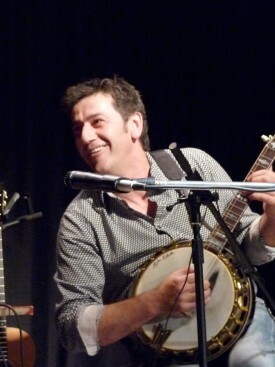 During a European tour, Tom brought the banjo to Fred. They stayed in contact, and met again in 2014 at the La Roche Bluegrass festival in the Alps. At Tom’s stand, Fred’s demos drew crowds, so Tom invited him to do the same at the Telluride and Bean Blossom festivals this year. 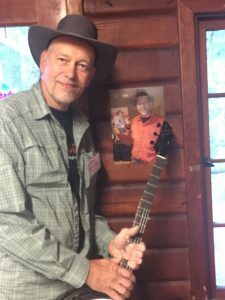 So if you haven’t been invited to a Banjo Bar yet, but you happen to be at the festival, here’s a chance to meet Fred and hear his music and Tom Nechville’s banjos. In the meantime, check him out on the web. This seems like a pompous question, right? Well, my purpose here is not to demean any other brands but to point out as clearly as possible how Nechville’s construction eliminates many potential problems. 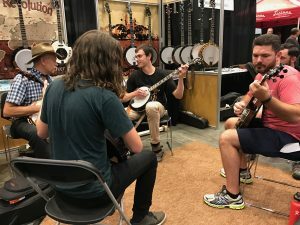 Since choice of tone and playability is to varying degrees adjustable on most banjos, it is worth understanding as much as possible about how they work in order to satisfy your perception of musical tone and reach your goals as a musician. What I want to address are the design limitations common to standard banjos that I find unacceptable, given the solution is now at hand. Let me give you my simple understanding with straight facts. If you pick up a banjo and the strings are too far away from the fingerboard to easily play, you would put it back down and look for another. Or if the strings are so low that they rattle on the frets. Either scenario is unacceptable for anyone seeking enjoyment from the instrument. In my role as repairman, I commonly deal with playability problems. The simple truth is that all these problems would not exist with a property functioning two way truss rod system in combination with a means for setting the angle of the neck up and down. Unfortunately for owners of traditional non-Nechville banjos, you are out of luck. 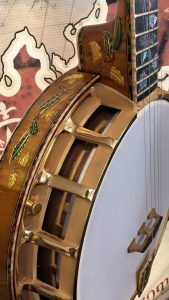 No means of angle adjustment exists on a traditional banjo. That means that only one size bridge can ever work on the instrument and it severely limits your tonal choices and ability to customize your playability. The problem is especially bad if if you are forced to use too small of a bridge. At Nechville we have done away with the antiquated non adjustable neck to rim attachments. The Quick-Cam system, standard on all helical mount and Flux capacitor equipped Flex-tones solves such problems and creates several additional benefits. All Nechville made instruments are not only infinitely adjustable throughout a wide range of action and bridge height choices, but are also instantly separable for transport or travel. Nechville modular design also means that trading or upgrading necks and other parts on Nechville’s is practical, quick, easy and fun. Let’s consider some other scenarios involving problems with a traditional banjo body. Let’s say that one of your hooks or nuts is rusty or impeded in some mechanical way. In that case it would be impossible to judge if you had achieved even tension on the banjo head. It is well known that even tension leads to balanced tone. With the numerous fasteners to equalize around the banjo body it is nearly impossible to achieve even tension on the head. We might all agree that a much more acceptable thing would be to have an automatically controlled head tension system. Another common problem is restriction of the natural tone of the acoustic chamber of the instrument from the mechanical fastening of rods and other metal parts. The whole instrument works together to produce its own sound, therefore the best banjos have been adjusted to minimize the negative effects of metallic connections. The rim, head and tone ring should be allowed to act as “tone components” while parts like the neck and hardware should provide structural integrity without limiting the effectiveness of the tone components. 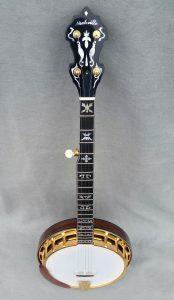 At Nechville, every effort has been dedicated to streamlining the banjo’s design. Our sound is automatically balanced because of our freely mounted tone ring system that is completely free from sound altering or restricting forces from coordinator rods or other metal parts. One part turns which places automatic even tension on the head. This results in unrestricted beautiful tone whether you want deep and dark or bright and snappy. Let’s consider a couple more unacceptable but easily remedied situations. With the advent of carefully sculpted bridges that account for the varying scale lengths of different string sizes, why to so many players still play with noticeable intonation problems? 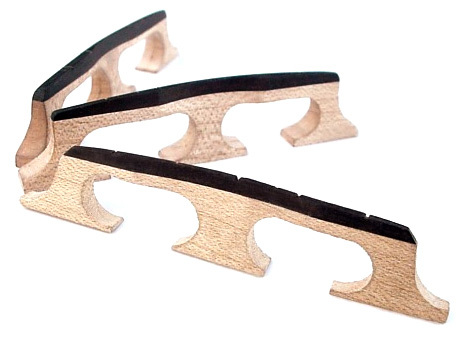 The easy solution is our Enterprise Bridge; made to correct intonation and to enhance playability. Perhaps the most frequent complaint is the banjo’s weight. While it is commonly assumed that the heavier banjos sound better, Nechville has proven otherwise. Many much lighter options are available for the Heli-Mount system that open up new frontiers in sound performance. 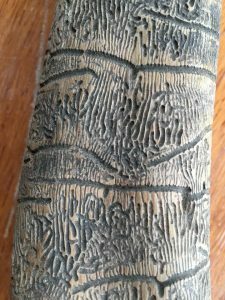 If that is not enough, consider another common complaint from banjo players, the discomfort that comes from your arm pressing against a hard metal edge on traditional banjos. All Nechvilles are equipped with Comfort Bevel wooden armrests that encourage long periods of practice and improvement. The Comfort Bevel armrest and Enterprise bridge are available from Nechville for any banjo. 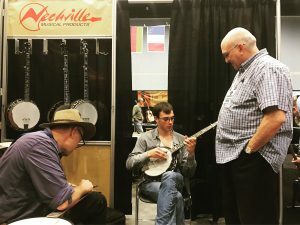 The physics of sound in a banjo is complex, but by simplifying the design without detracting from its potentials, Nechville has made it easier and much more possible to control the resulting tone to your liking. We are dedicated to your success in music and are here to help whether it be in improving your existing instrument or building your custom creation.